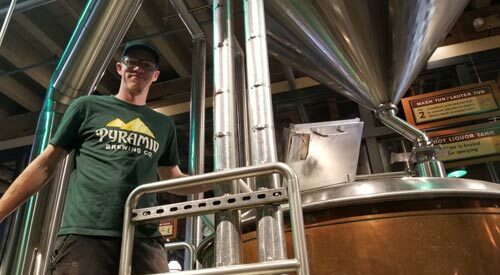 Pyramid Brewing recently announced the introduction of Josh Riggs as Innovation Brewer, working in the Brewery and Alehouse in Seattle’s SoDo neighborhood. In this role, Josh will direct and manage all brewing processes for the Seattle operations, which houses a 15-barrel, 2-vessel brew system with four fermenters and four bright tanks. SEATTLE (June 22, 2018) – Pyramid Brewing Co. welcomes Josh Riggs as the Innovation Brewer, working in the Brewery and Alehouse in Seattle’s SoDo neighborhood. In this role, Riggs will lead and manage all brewing processes for the Seattle operations, which houses a 15 bbl 2 vessel brew system with 4 fermenters and 4 bright tanks. Promoted from lead brewer at Pyramid, Riggs brings almost 15 years of experience within the craft brewing industry, including tenures with Mount Shasta Brewing Co. and two microbreweries in Oregon. He holds a Malting & Brewing Certificate from Master Brewers Association of America. Pyramid’s mission is to inspire life’s everyday adventures with craft beer. Riggs will lead the charge in bringing the Pacific Northwest experience to all aspects of brewing production, seeking the best local ingredients and encouraging consumers to enjoy their passions with craft beer. Pyramid seeks to encourage those moments with fantastic beers worth sharing, and to introduce new styles of beer along the way. Creating great beer is a given in today’s industry, but what’s next? Riggs will stay abreast of growing tastes and trends in the brewing industry. To simultaneously push the boundaries of what’s expected from Pyramid, he will cultivate relationships with hop growers, investigate new ingredients and hop varieties, and lead the development of new recipes. As part of a triple bottom line business strategy, Pyramid Brewing Co. prioritizes people, planet and profits to drive business results and reduce its social and environmental footprints. In alignment with Pyramid’s culture to reduce social and environmental impacts, Riggs will work to develop efficient operating procedures and making recommendations for improvements around the brewery. Investing time and resources into meaningful projects that strengthen the city, improve the environment, and fit within Pyramid’s culture. As a brewery, Pyramid measures success by the ability to not only brew and sell beer, but to also contribute to the community. As an ambassador for Pyramid, the community can look forward to Riggs elevating the brand at Washington Brewer’s Guild, the Alehouse, beer dinners, festivals, sampling events, and other events related to craft beverages. Please share and enjoy Pyramid beers responsibly. For more news and events, follow Pyramid Brewing Co. on Facebook, Instagram and Twitter at @pyramidbrew and share your adventures with #findyourpyramid.